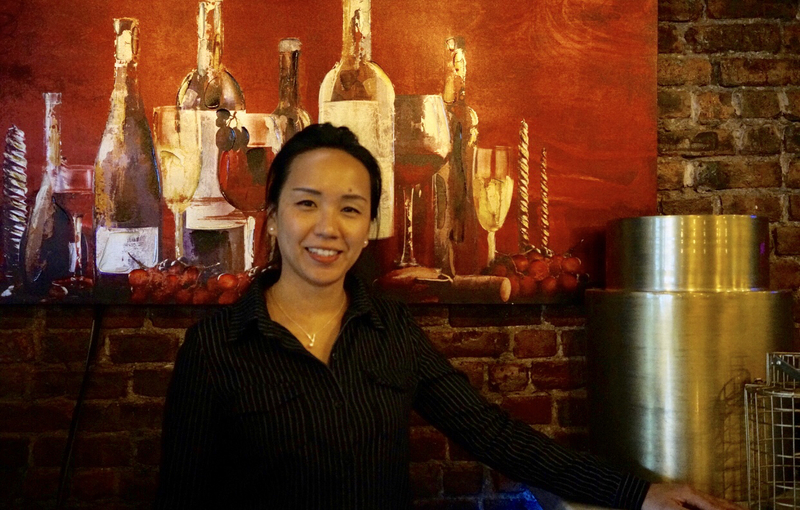 This is Xiu Chen, the owner of Rice K, an Asian fusion restaurant that offers Chinese-American cuisine, Japanese cuisine and Thai cuisine that caters to the varied clientele that they serve in Astoria. Xiu’s family has owned a restaurant in the neighborhood for over 22 years. Her father began learning how to cook after emigrating from China with Xiu and her mother and became a chef in the Bronx, cooking Chinese-American food. As he honed his craft and started improving his cooking skills, he decided to start his own restaurant and thought Astoria was a nice neighborhood and a good place for him to build his business. 20 years later, Xiu is carrying on her father’s legacy by continuing the family business. She effortlessly blends their established reputation and authentic recipes with modern food trends, allowing the business to continue to grow, while also raising her daughter and running the business on her own. Xiu grew up working in the restaurant business from a very young age. She used to stand on a box on the floor at her father’s restaurant so that she could work at the register, so she knows a lot of people in the area that have watched her grow up. Although she enjoyed working there, she says she never planned on taking over the business. She studied marketing in college and after meeting her husband, they moved to China for 6 years to see how they could get involved in China’s quickly growing economy. They ended up starting a construction business and began creating a home in China. However, Xiu’s father was getting older and she felt that it was time for him to retire. At the same time, her daughter, Audrey, was getting ready to start school and she wanted her to begin her education in the U.S. Therefore, it made sense to Xiu that she come back to the U.S., take over the restaurant and set up a home in New York as well. So 2 years ago, she returned to Astoria and took over the business. Although she never saw herself taking the business over from her father, Xiu says she really does enjoy her job, mainly because of the staff that she works with and the customers that she gets to meet. She says hearing people’s stories and getting to know each person in the neighborhood that comes in is the most rewarding part of the business. These are the people that keep her going, especially when the business gets tough. Xiu’s husband still lives in China and handles their construction business so she runs the restaurant on her own, which she admits gets difficult when you have to be responsible for everything from staffing to food prep to accounting. Most days she’s at the restaurant from 11AM to 11PM or later so it’s hard to balance her time at work and her time with her daughter but she does her best to make sure neither one feels like they aren’t her top priority. Her daughter (now in 1st grade) will come to the restaurant after school a few days a week and Xiu does homework with her and goes through her lessons before Xiu’s parents take over. Luckily they are able to watch Audrey while Xiu works, since her father is now retired, and although they have a good system, Xiu says it’s not something she necessarily wants to pass onto her daughter. “It depends in the future if she likes cooking and if she likes the restaurant business because it’s so much to encompass” but if it’s something she chooses, Xiu will support her. In the mean time, she tries not to put any expectation on her daughter because she knows how hard the business can be. When she took over the business, she knew it would be tough and it was a hard decision for her to make, but now that she has taken it over, she isn’t looking back. As she says, “you only look forward”. Xiu’s focus now is figuring out her plan for the future and what she needs to do to keep the business growing. She’s very aware that she’s responsible for the business’s success and how that impacts herself, her family and her staff. Which is why she’s made updates to keep the business relevant with the younger generations that have been moving into Astoria in recent years. She’s made changes to the restaurant, remodeling the layout and adding a kid’s menu and most recently, adding karaoke on Thursday, Friday and Saturday nights. She notes that they’re “probably one of the only restaurants that does that” with a laugh, but unique additions to the business are what have helped her bring in new customers and differentiate themselves from the numerous other restaurants that surround them. However, when adding in these changes, Xiu has been sure to keep the core of the restaurant the same: a family run business that cares about its community. Xiu and her staff take the business very personally, greeting people by name if they can and making sure that each customer feels welcomed and taken care of. It’s these simple gestures and the genuine care that she puts into the business that has allowed Rice K’s legacy to live on. Next Entry:Spook-tacular Ways to Celebrate Halloween at the Office!